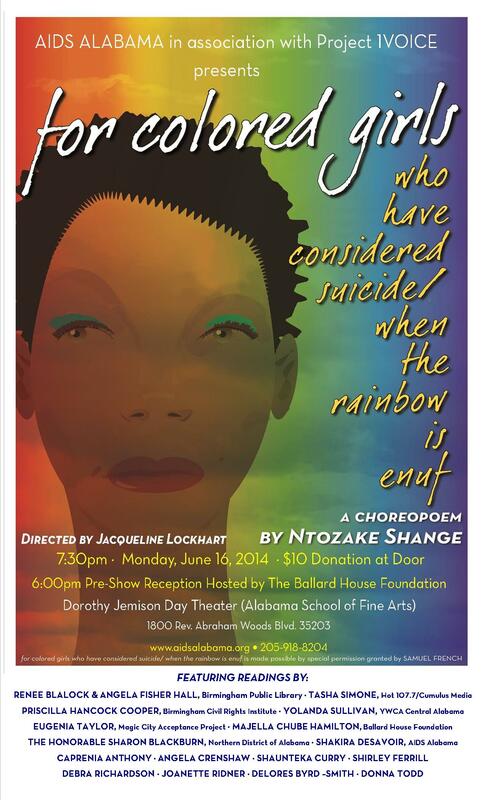 On Monday, June 16, 2014, AIDS Alabama presents FOR COLORED GIRLS WHO HAVE CONSIDERED SUICIDE / WHEN THE RAINBOW IS ENUF by Ntozake Shange at the Alabama School of Fine Arts Dorothy Jemison Day Theatre. The event begins with a Pre-Show Reception at 6:00pm hosted by The Ballard House Project, Inc. The performance will begin at 7:30pm and is directed by Jacqueline Lockhart. Admission is a minimum donation of $10 at the door. This event is sponsored by the Southern AIDS Coalition and the Ballard House Project, Inc. The content is mature and recommended for adults only. This event is in partnership with Project1VOICE, a national organization whose mission is to strengthen and promote African American theater and playwrights through innovative initiatives and community engagement. This performance is part of Project 1VOICE’s fourth annual national event, 1VOICE/1PLAY/1DAY. This year’s event will include performances in more than thirty cities around the world on June 16th to celebrate womanhood and focus on empowering women and girls. Cast members include: Caprenia Anthony (Actress/Health Advocate,) The Honorable Sharon Blackburn (Federal Court Northern District of Alabama), Renee Blalock and Angela Fisher Hall (Birmingham Public Library), Priscilla Hancock Cooper (Interim CEO, Birmingham Civil Rights Institute), Yolanda Sullivan (CEO of YWCA Central Alabama), Angela Crenshaw (Actress/Law Enforcement Officer), Shaunteka Curry (Spoken Word Artist), Debra Richardson (Community Advocate), Majella Chube-Hamilton (Ballard House Project, Inc.), Shirley Ferrill (Actress/Community Activist), Tasha Simone (Radio Personality, HOT 107.7/Cumulus Media), Eugenia Taylor (Magic City Acceptance Project), Shakira DeSavoir (AIDS Alabama), Joanette Ridner (Community Participant), Delores Byrd-Smith (Actress), and Donna Todd (Actress/Choreographer for original Birmingham production of FOR COLORED GIRLS in 1980). “There is great power when we unite as a community. This event will bring attention, education and conversation about current social issues including AIDS and domestic violence. There is also a lighter side to Shanges’ words that remind me, and hopefully the audience, of the importance of creating memories, living life to its fullest. I wasn’t born when this “choreopoem” first hit Broadway, yet it is so relevant to my living today.” – Tasha Simone, HOT 107.7, Cumulus Media.